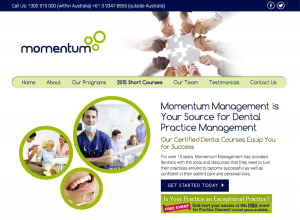 Momentum Dental Practice Management Website Launched! Momentum Management is a leading dental practice management organization in Australia that has been providing dentists with the resources necessary to make their practices successful for more than 15 years. Momentum guides their clients through each and every step of the practice transformation process. Smile Marketing has partnered with Momentum Management to offer a FREE event to dental practice owners who are looking to turn their dental practice into an exceptional practice! Dentists attending the event in Australia will get practice management tips and tricks, as well as tips for how they can immediately makes changes to optimize their dental website and online presence to get new patients.